These days there are a myriad of guitars and amplifiers made in the Far East or in Pacific Rim countries that are not just wonderful beginner instruments, but great professional guitars and basses as well. Of course the United States and Europe are turning out amazing guitars and basses that are more technologically advanced than ever before. 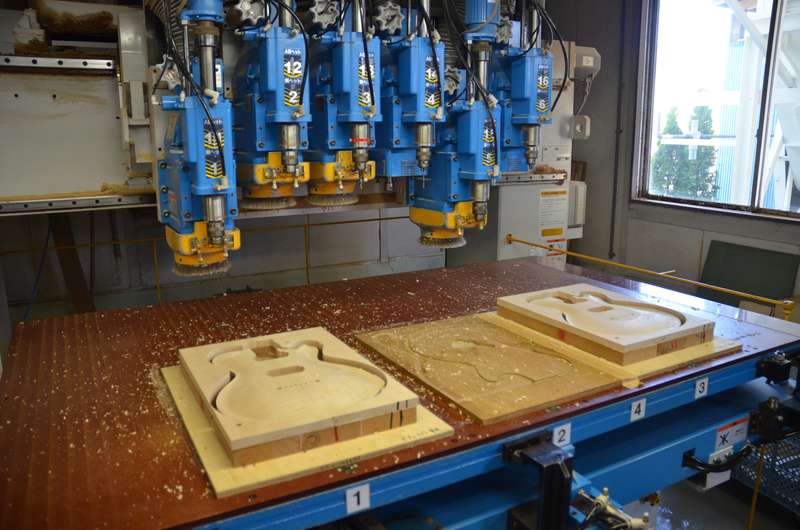 Musical instruments are now made with computer aided design and CNC tools that give them excellent tonality.50 years ago there were no computerized tools. Although computers were available they were large enough to fill a room and did not have much memory. 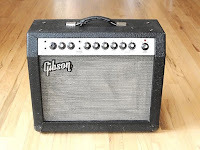 Research, development and upgrades in amplifier modeling have given even a small practice amp some very usable tones that would make a kid from 1965 envious. 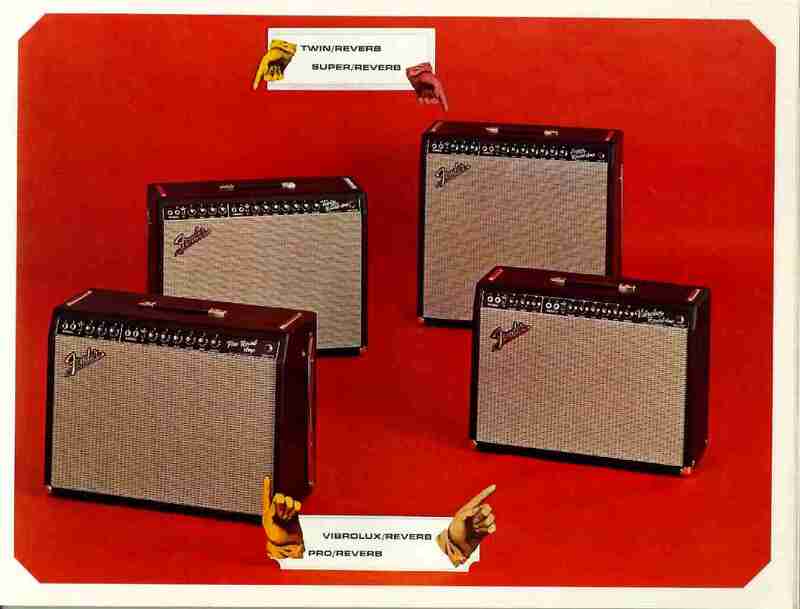 Ironically in 1965 most of the amplifiers available were tube amps. 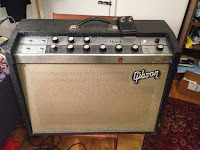 For many years since '65, guitarists have sought that warm tube tone and breakup, but in 1965 when a clean sound with lots of headroom was desirable, most low wattage tube amps distorted like crazy. In all honesty some of the tube amps featured in those days were not all that great. The tubes got hot and frequently burnt out. 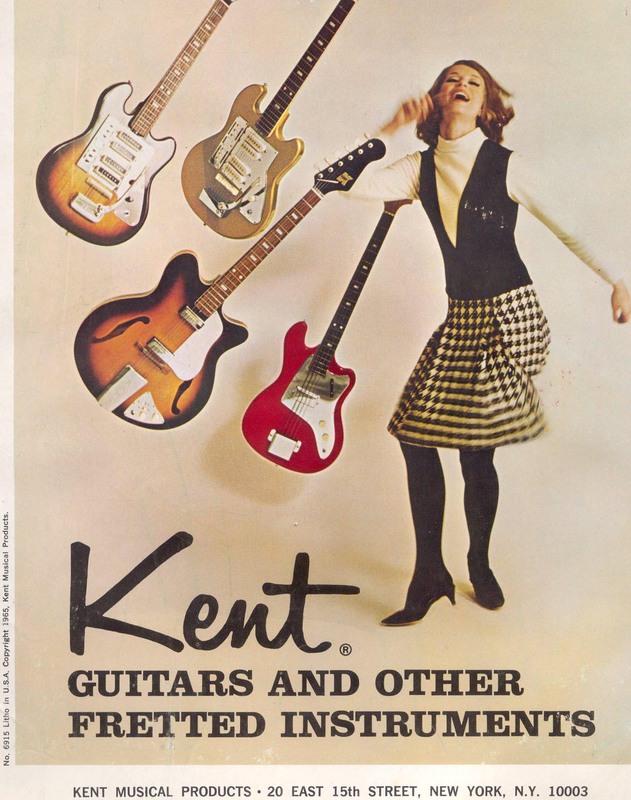 Aside from that, the quality of 1965's budget guitars was "iffy." Some guitars and basses made fifty years ago were downright unplayable. 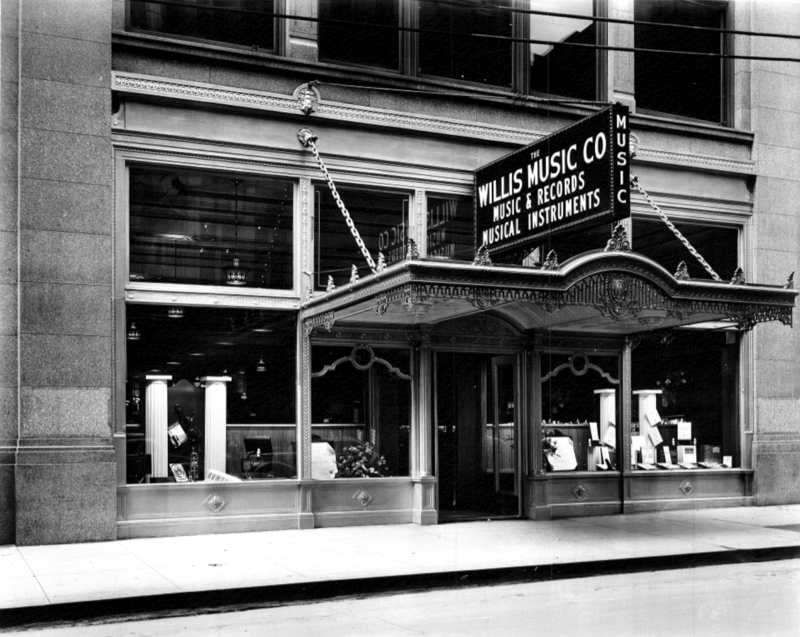 I was 12 years old in 1964 when my Dad took me to Will’s Pawn Shop in downtown Cincinnati Ohio to pick out a guitar. The guy at the pawn shop took down a late 1940’s model Harmony Patrician and said, “Now here is a great guitar. Your kid will need a set of strings and a pitch pipe to tune it. That will be Twenty dollars.” I took it home on the bus. The strings were probably a half an inch off the neck at the 12th fret. Those strings were made by the Black Diamond String Company. 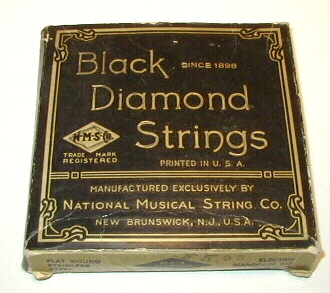 I’m surprised Black Diamond Strings are still in the business of selling strings, because back in those days the strings came in only one size; Extra heavy. They made my fingers sore and stressed the guitars neck. But I persevered and learned to play basic chords at a local YMCA class. By 1965 I was ready for an electric guitar. I acquired as many catalogs as I could find. There was no internet or Musician’s Friend. In those days all we had was Sears and Roebuck, Montgomery Wards, JC Penny’s, Western Auto and Spiegel’s. I had no idea that most of the guitars and amplifiers were made by the same companies’ which were either Chicago Musical Instruments, National-Valco, Kay, Danelectro and a few others. And at the time imported guitars from Japan were flooding the market too. So I was looking and hoping to get a guitar from one of these catalogs. I had my sights set on this double cutaway solid body Harmony guitar. Imagine my surprise when Dad took me to a local music store. The dealer pulled out three cases that contained three very used Fender Stratocasters. The Strat also came with an original tweed case. As I recall it cost $150. I had no clue at the time it was a 1958 model. I had my electric guitar, but needed an amplifier. We drove off to the local Western Auto store and purchased a Kay Model 703 amplifier. It had 3 odd tubes, a 35Z5 rectifier tube; a 50L6 model output tube, a 12AU6 preamp tube, 3 instrument inputs and a volume/on/off control and a tone control. I believe it had a 6” speaker with a transformer attached to the basket. I still have this amplifier. The speaker was replaced many years ago. From recent specs I find it put out slightly less than 4 watts. One of my friends rigged it up to change one of the guitar inputs to an external speaker input. I think Dad paid about $25 for this little amp. I see them selling on eBay now for $400 and up. 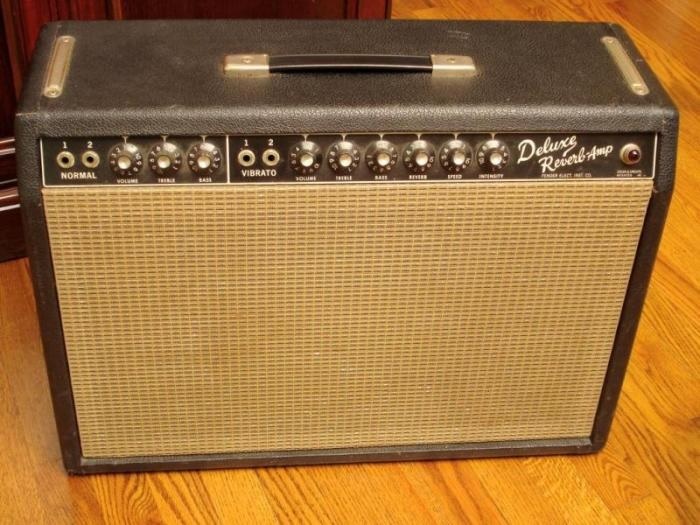 Of course this amp could not be heard over drums, so I saved up money and within a year bought a 1965 Fender Deluxe Reverb for $200. I took music lessons at a music store and at every chance I got went to other music stores and bugged the clerks to tell me about this guitar or that guitar. Along the way, I gained a little knowledge. So let me describe to you what musical equipment was new and available 1965 and tell a little about the guitars and amps that were new then and have become vintage now. 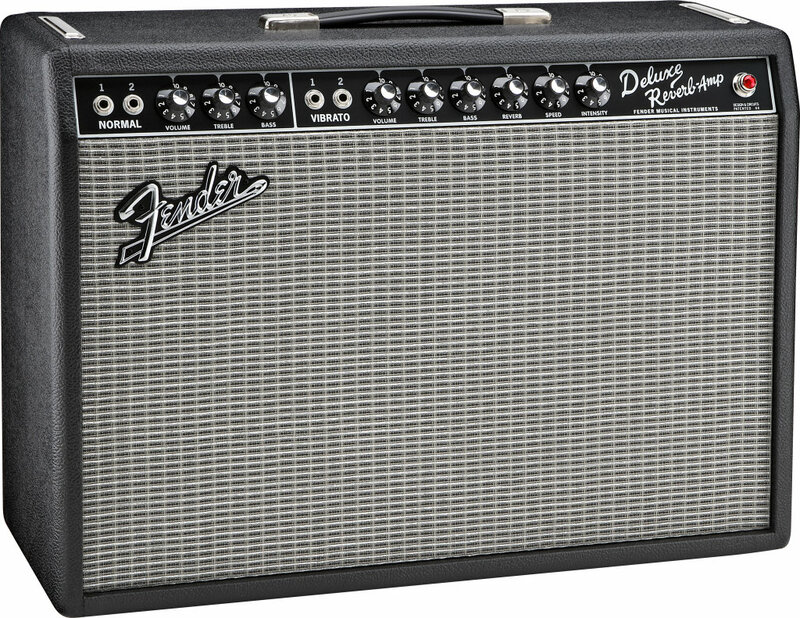 If you could afford it, Fender was offering some fine new guitars and amplifiers. 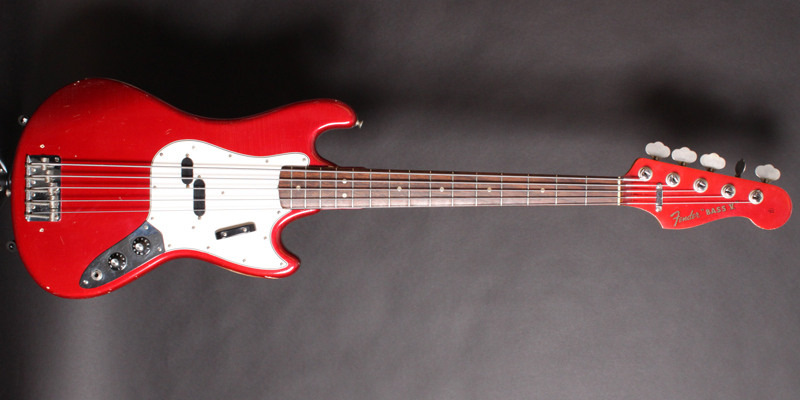 You may recall 1965 was the year that CBS purchased the Fender Company and its assets. However there was still plenty of new old stock being sold in 1965. The big CBS changes would not take place for a few years. 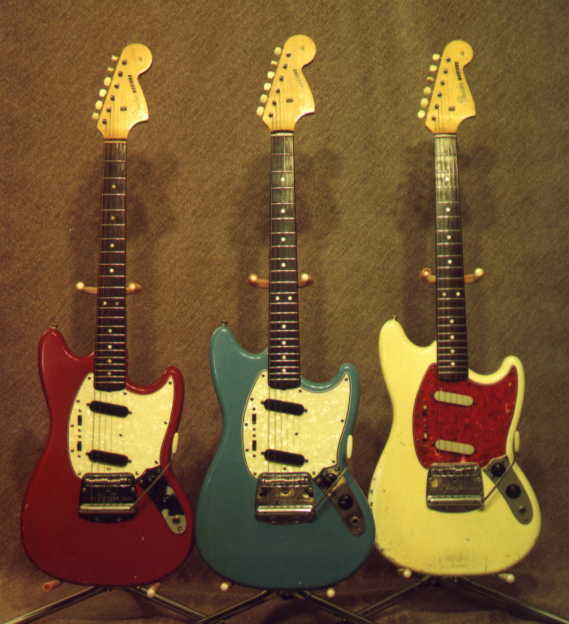 As far as guitars, in 1965 Fender was selling everything from the student models the Music Master and the Duo-Sonic to the Jaguar and Jazzmaster. This was the year that Fender introduced the Mustang. Fender also came out with a Fender thin-line Electric guitar that was originally known as the known as Acoustic Electric and was later dubbed The Coronado. In 1965 Fender also came out with several models of acoustic guitars including The Kingman, The Concert, The Newporter and The Shenandoah. 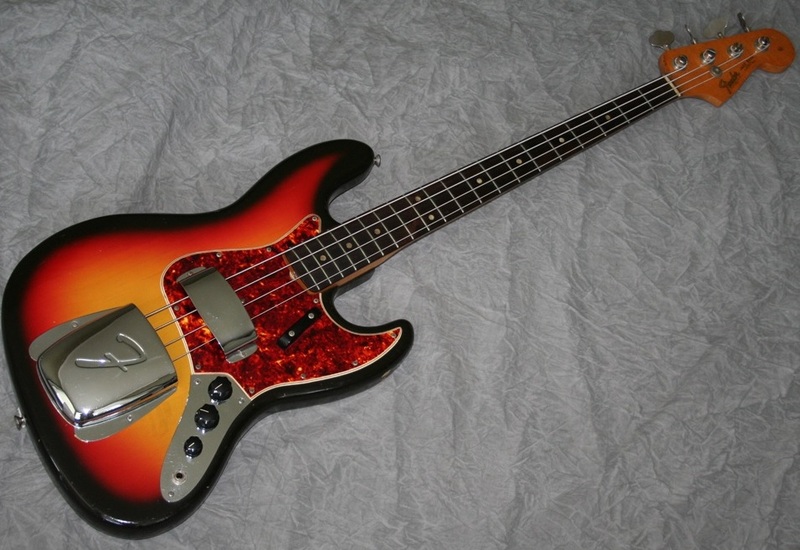 Fender was offering its usual selection of bass guitars; The Precision and The Jazz Bass. 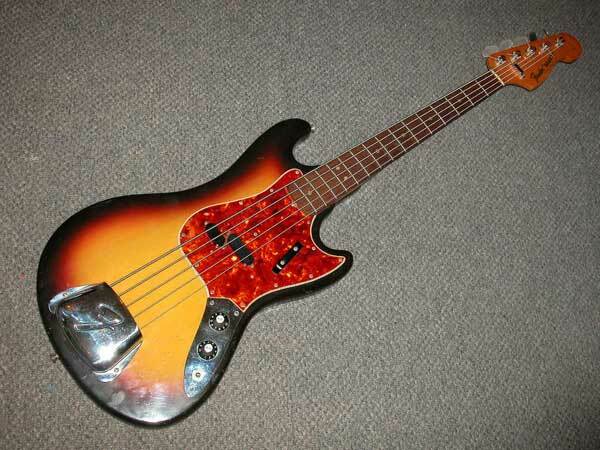 However 1965 was also the first year for the short scale Fender Mustang bass. Fender also came out with the Bass V this year, which was sort of an anomaly, Instead of having a low A 5th string, it had a high 1st string tuned to B. 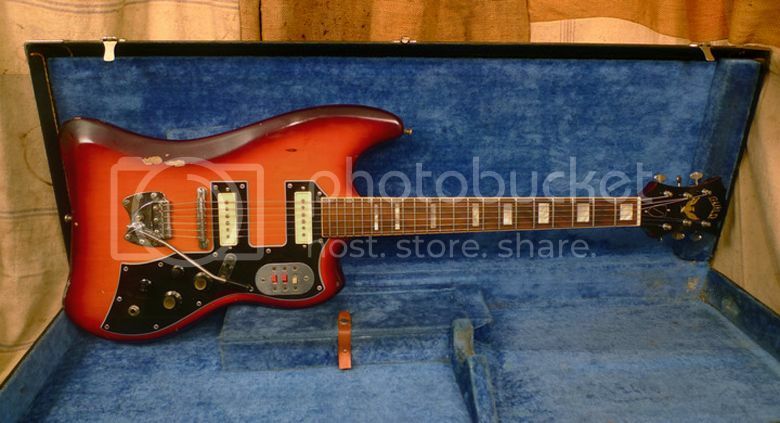 One of my favorite guitars of 1965 was the Fender XII. This was Fender's answer to the Rickenbacker 12 string electric. One of the features that made this guitar popular especially with the pros was its adjustable bridge which kept the guitar in perfect tune. It also had a very interesting pickup switching electronics. 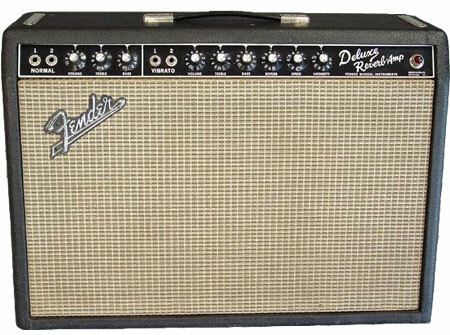 All Fender amplifiers, by this year, had the control panel in the front on a black face panel and amp choices ranged from the Champ to the Dual Showman. Fender's biggest rival in the electric guitar market was Gibson. Gibson offered quite a range of products. Many of my friends owned a Gibson Melody Maker. In 1965 the Melody Maker came with the double cutaways. The pickups and electronics were all mounted on the black plastic pick guard. The one pickup models came with a bridge mounted single coil pickup, while the twin pickup also had a neck pickup. 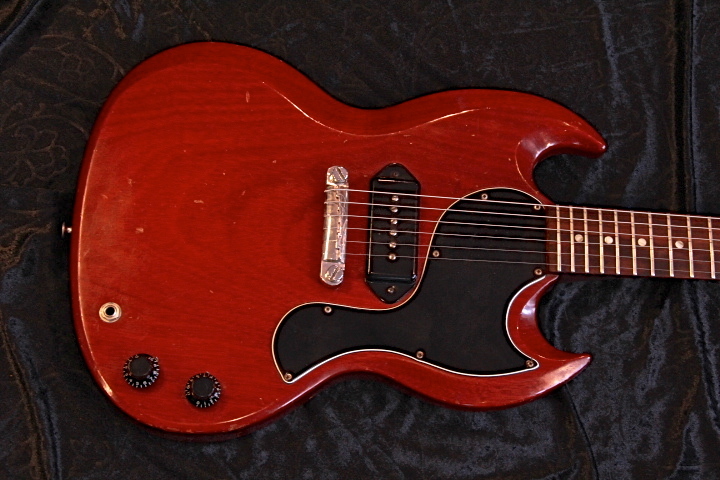 Most folks I knew owned a brown sunburst model, but in 1965 was the first year that the Melody Maker was offered in cherry red. 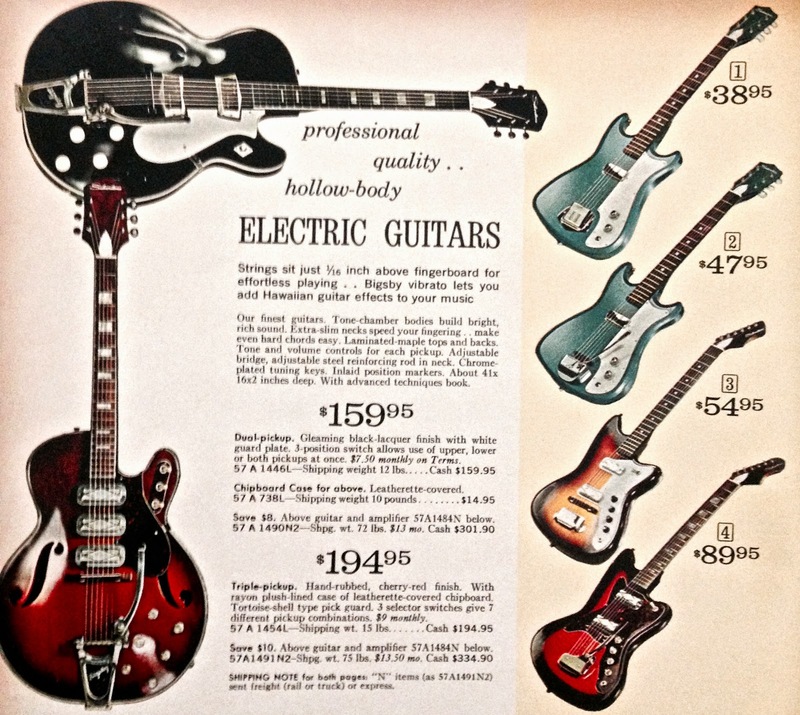 The most likely Gibson to be seen on TV was the ES-335 or ES-345. It would be a few years before the Gibson Les Paul regained it's popularity. 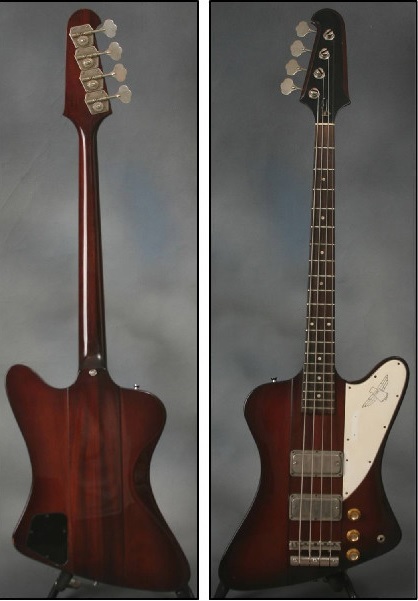 In 1965 Gibson was also offering its unusual Firebird electric guitar and Thunderbird bass. This same year Gibson offered The Non-Reverse Firebird, which more or less resembled a Fender Jaguar/Jazzmaster. 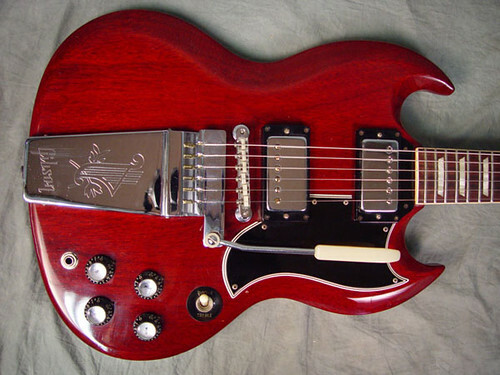 The Gibson SG was offered in several differing formats, from the SG Jr and the SG Standard, which was an awesome guitar. 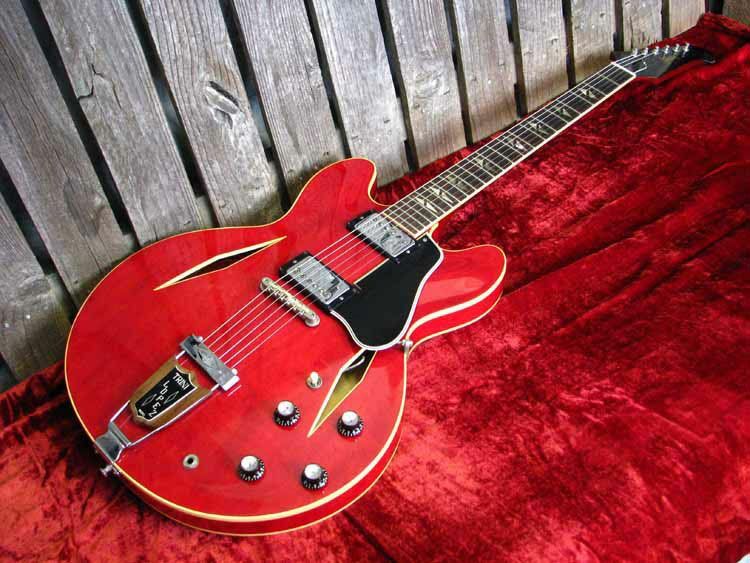 In 1965 Gibson also came out with the Trini Lopez Deluxe and the Trini Lopez Standard guitar. Dave Grohl played the Trini Lopez Standard before he got his own model. 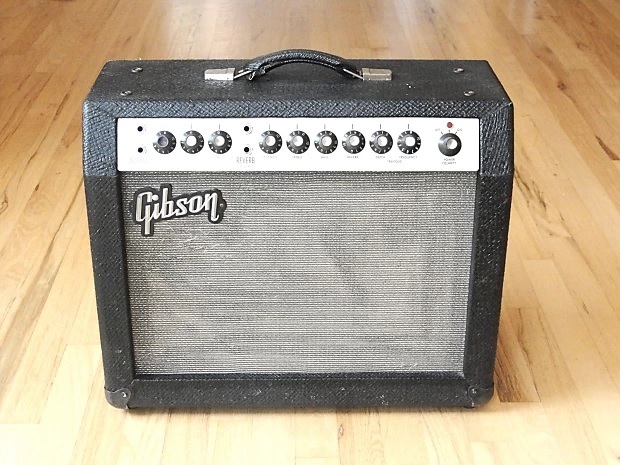 Gibson had two amplifier styles available this year. The Hawk, The Falcon and The Scout all had control panels mounted on the top of the chassis. 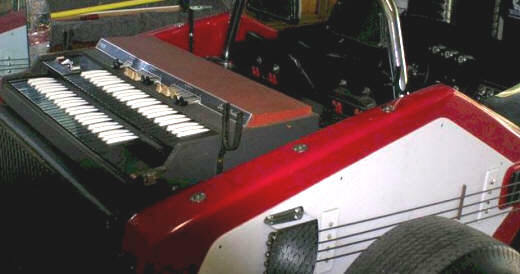 The Skylark, The Minuteman, The Explorer and others were more Fender-like with the control panel facing forward. 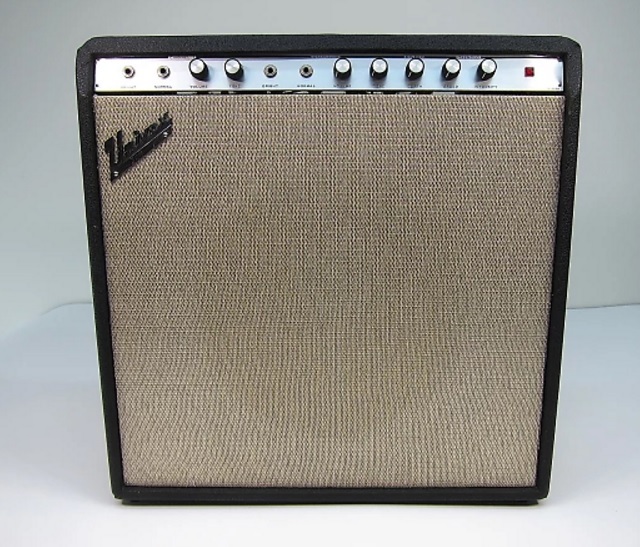 Although these were great amps, due to the electronic design, they never seemed to have the power and tone of Fender amps and subsequently were not as popular. Guild guitars were fairly popular too. 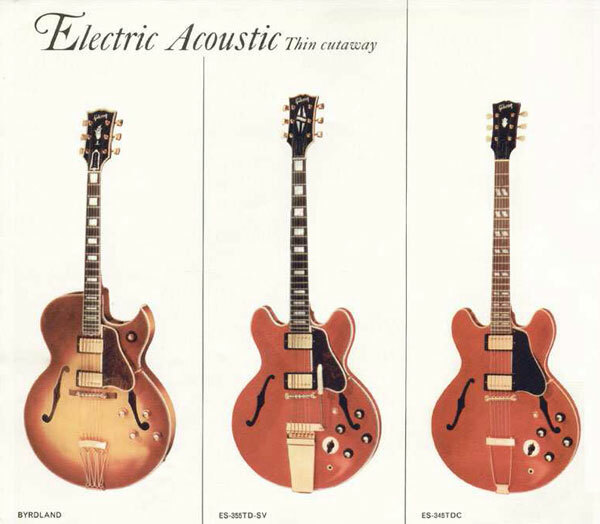 Guild offered some traditional looking hollow body and semi-hollow body models such as the T-100, the Starfire, the Capri and the DE-400 model. DE stood for Duane Eddy, who was using this guitar at the time. 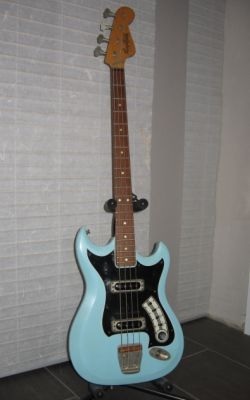 Guild also offered a Starfire Bass Guitar. I've seen this guitar offered with only a single pickup, that was usually mounted by the bridge although some came with a pickup in the neck position. 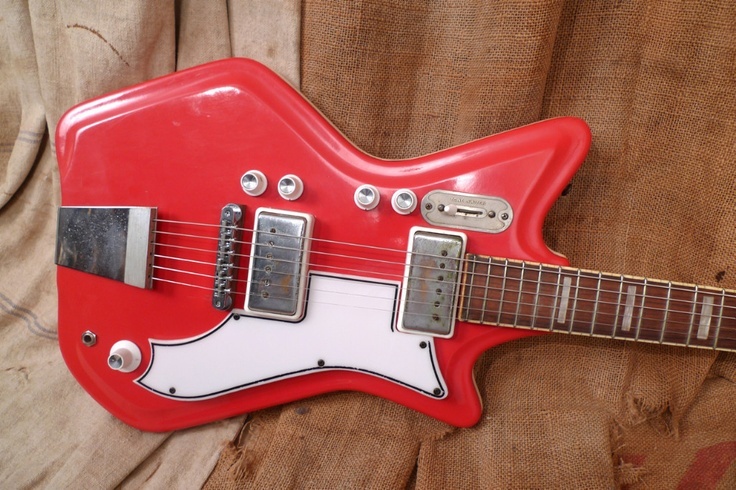 In 1965 Guild came out with some strange looking electric guitars. The Guild Thunderbird was a real anomaly. Its body sort of resembled the clay cartoon figure Gumby. Perhaps it was Guilds answer to the Fender Jazzmaster. 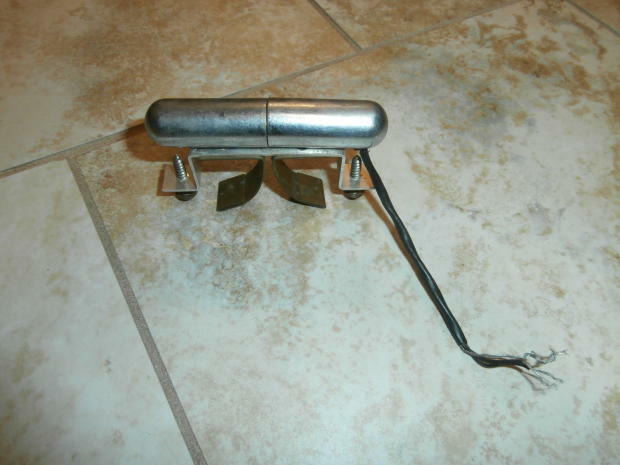 The Thunderbird came with some unusual electronics, a vibrato bar and a spring loaded metal bar that was built into the guitars back. This feature and the two corners on the bottom of the body allowed the guitar to have a built in stand. Zal Yanovsky of the Lovin' Spoonful played a Guild Thunderbird. 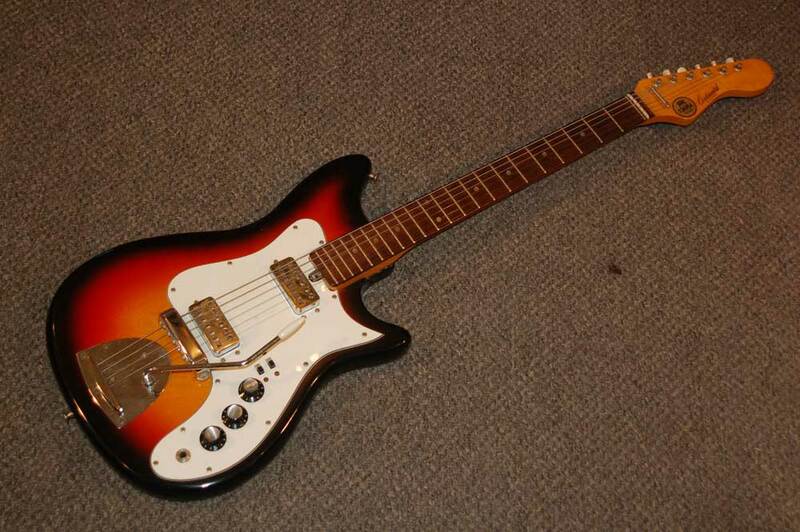 Guild also offered a budget version of this guitar with a slightly different shape called The Jetstar. Guild was never big in the amplifier department, but the did come out with the Guild Thunder amplifier with numeral designations based on the amps power. 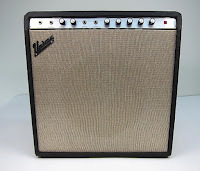 Guild's amplifiers were actually made by Valco. Ironically the name Guild was originally attached to a little known amplifier company that was going out of business. Alfred Dronge and George Mann bought the company and also employed former Epiphone workers that had lost their employment when Gibson purchased Epiphone. 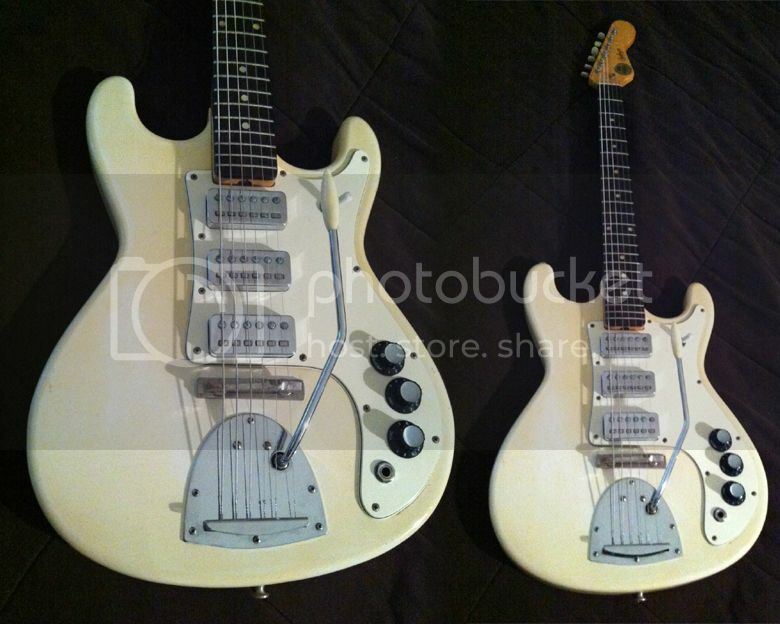 Guild electric guitars from 1965 are excellent guitars, even the Gumby guitar is a great player. I've never used a Guld amplifier or run across one. 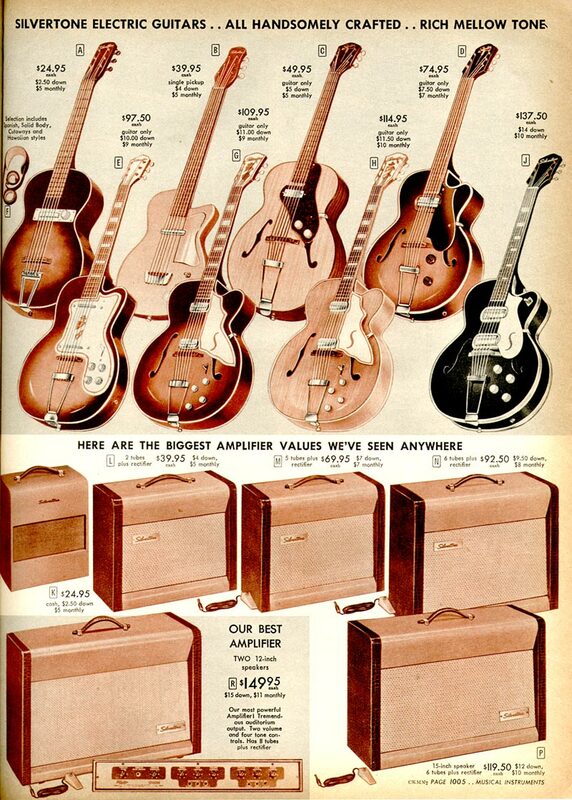 In 1965 Gretsch Guitars were also popular and at the time were made in the USA. 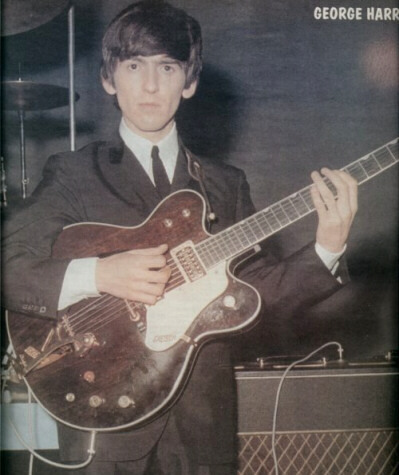 George Harrison played several models of Gretsch, his first was a Duo-Jet.. He later purchase a double cutaway Country Gentleman. His first was destroyed in an automobile accident in 1965 when it fell off a lorrie. 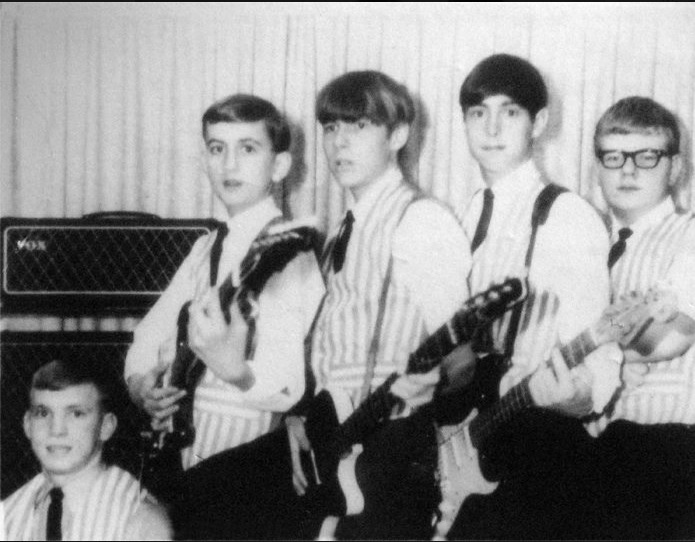 Other British Invasion groups seemed to gravitate to Gretsch guitars. Compared to some other brands, Gretsch guitars were more expensive, therefore not as popular with struggling garage bands of the day. I did know a few guys that owned Gretsch Tennesseans. Gretsch guitars were made in their Brooklyn New York factory until the brand was purchased by the Baldwin piano company which unfortunately did not do a very good job of maintaining this well-known old company. 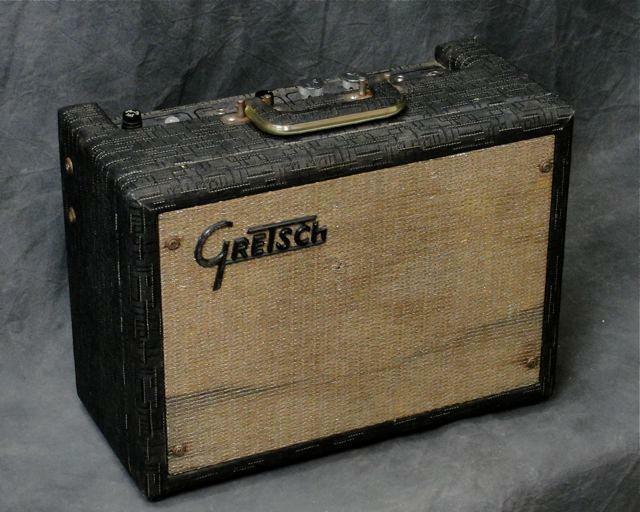 Although Gretsch did offer amplifiers these amplifiers, they were actually made by the Valco Company. 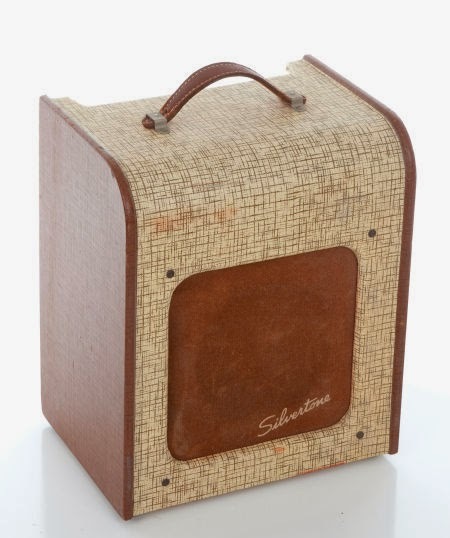 One thing that the Baldwin did when they purchased Gretsch, was to redesign and come up with a new guitar amplifier. Baldwins' forte was pianos and organs. 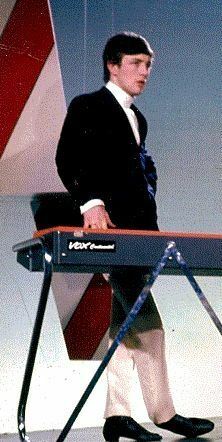 Therefore they used their organ technology to come up with a line of guitar solid-state guitar and bass amplifiers under the Baldwin logo. 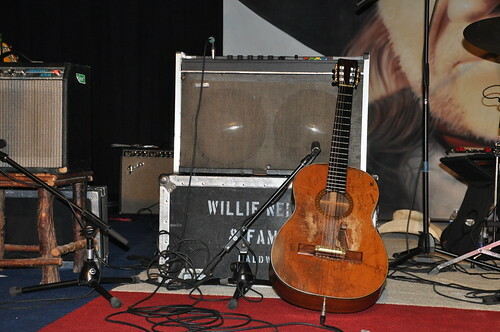 Willie Nelson has been relying on his old Baldwin amp for years. 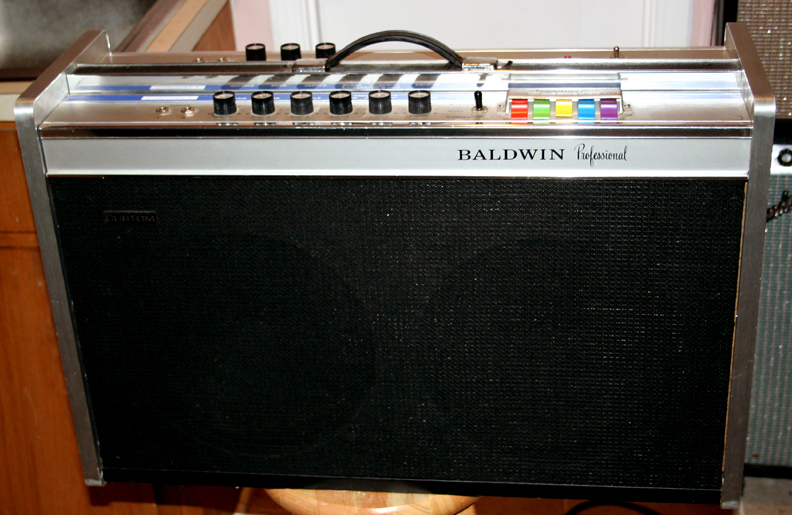 Probably he most well known Baldwin amplifier was called The Exterminator. This was a huge beast with two 8-inch speakers, two 15-inch speakers, and two 12-inch speakers with 100 watts RMS. You needed a couple of "roadies" and a large van to tote this amplifer to your gigs. 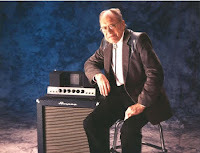 Baldwin offered several other versions of solid-state amps; most were in the range of 40-45 watts RMS. Despite being well made they just did not sell in a market where Fender was king. 1965 was the year that Vox was introduced to the United States. Vox had been been popular in the U.K. since the late 1950's. 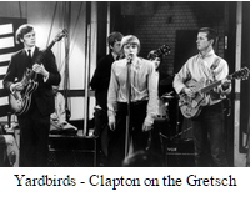 It was the choice of amplification for the Beatles and many of the other British invasion bands. 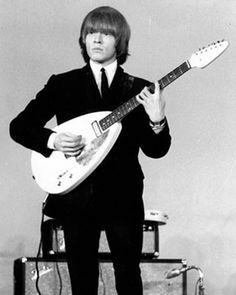 They were offering guitars too; and combo organs.. Brian Jones of the Rolling Stones was playing a lute-shaped Vox guitar. 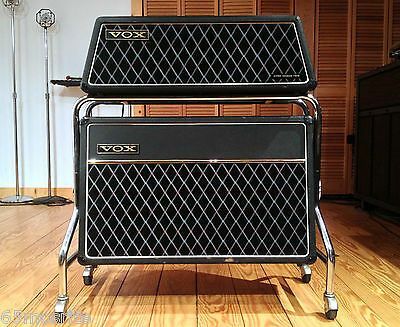 Several prominent music stores were now selling Vox amplifiers and guitars. The Thomas Organ company was starting to manufacture US made solid-state Vox amplifiers. But what about us guys, with meager income, that spent the weekends in someone's basement or garage, hoping to be the next big thing or at least impress the ladies? There were plenty of guitars, basses and amplifiers available at bargain prices. And some were very good, and sought after in today's vintage market. 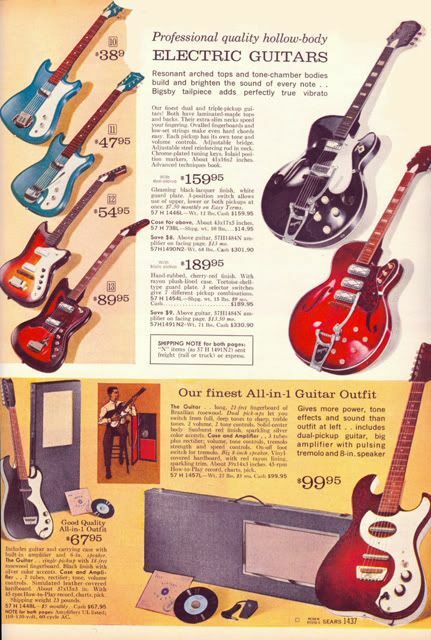 In 1965 you could get out the Sears or Montgomery Ward catalog and have a Danelectro, Kay or Harmony guitar or bass delivered right to your front door. These instruments were for the most part made in the USA and well constructed. We all know about their construction of Danelectro guitars which used Masonite tops mounted on a poplar wood frame with the pickup casings made of lipstick tubes. The pickups inside the lipstick containers were made with alnico magnets. Most Danelectros were made in New Jersey and most were sold through Sears under the Silvertone logo. I knew so many young guys in 1965 that owned and learned on Danelectro/Silvertone guitars and basses. 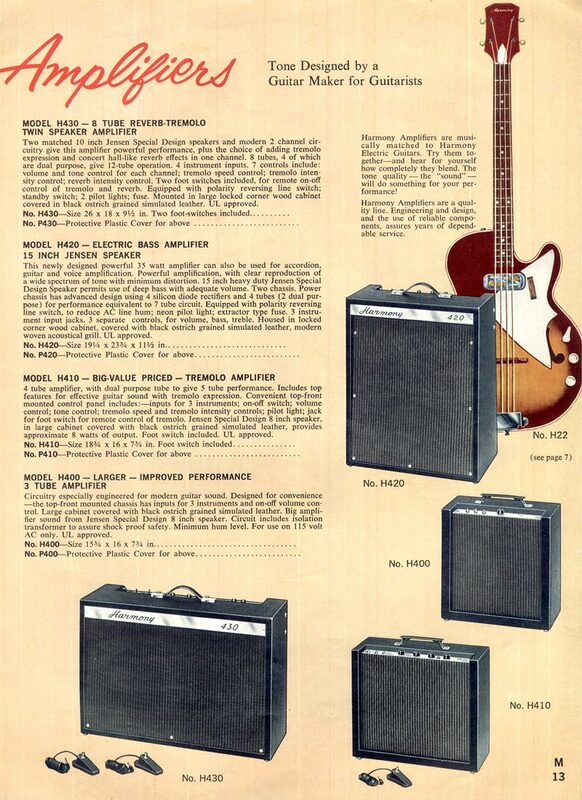 Danelectro also made some nice amplifiers back in 1965. 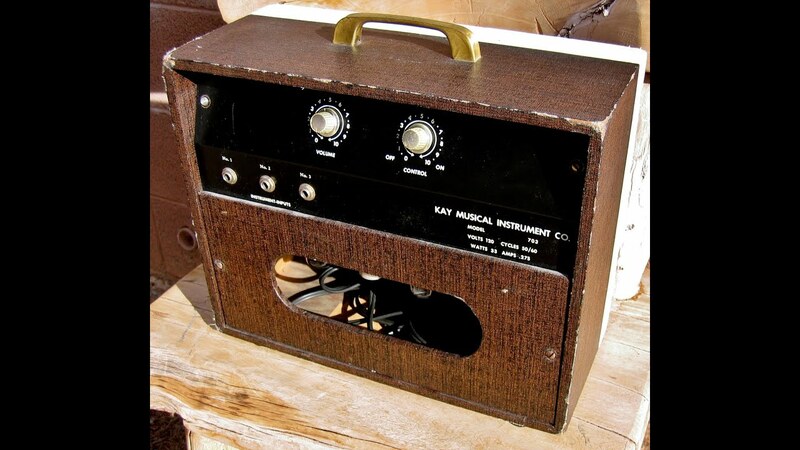 Most were sold through Sears as Silvertone amplifiers. 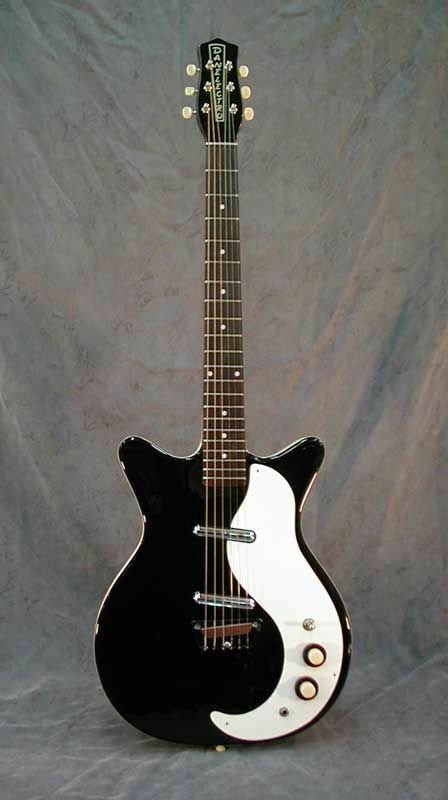 The Dano-made Silvertone Twin Twelve 1484 is a classic. Electronically and from a sound standpoint, I give it high marks. But in regards to construction, it was done on the cheap. The chassis was made of particle board, the speaker baffle was constructed of quarter inch masonite board and the amp was covered with a thin gray and black fabric. Valco also produced amplifiers for Silvertone/Sears. Valco also sold them under a myriad of names including Airline, Supro, Gretsch, Guild, and Oahu. 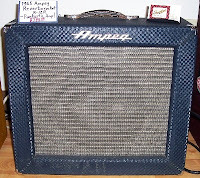 They were possibly the first company to offer the "amp-in-a -case." The Airline brand of guitars were sold by Montgomery Wards. Many of these guitars were made by Valco (with encompassed National and Supro). 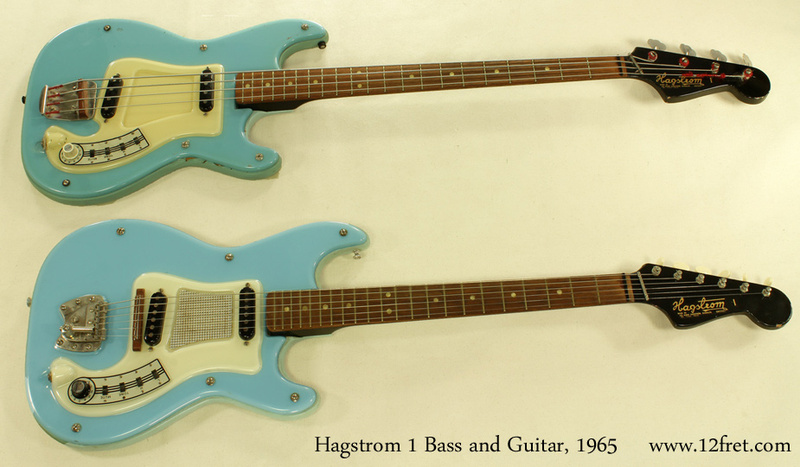 These guitars and basses had modernistic Res-o-Glass bodies (fiberglass) and unique pickup arrangements. Some even came with a piezo element mounted in the guitars bridge. Most amplifiers sold under the Airline brand were manufactured by Valco. This included a wonderful amp called the Supro Thunderbolt. I've profiled this amp before. 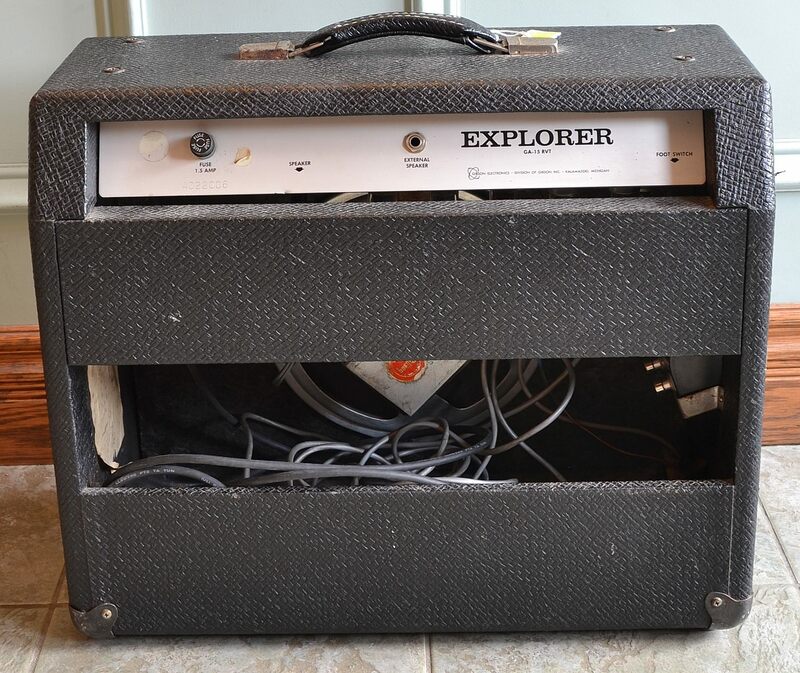 It was marketed as a bass amp, but was better suited as a guitar amp. All the catalog companies sold a fair share of Harmony and Kay guitars. Although they were marketed as Silvertone or Airline or even True-Tone. The quality might not have been as good as Fender or Gibson, but they were respectable players and great starter instruments. Kay guitars, at the time, were made in Chicago. The Harmony Guitars brand was actually purchased by Sears and the guitars and basses were manufactured by The Chicago Musical Instrument Company. There was one other respectable amplifier company that I need to mention. 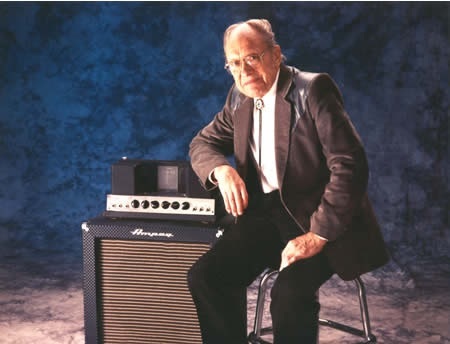 Ampeg was founded in New York by Everett Hull. He had invented a microphonic device to place in the peg hole of an upright bass, to amplify its sound with almost no distortion. Hence the name Amp-Peg. The company came up with some very well designed amplifiers that were used mostly by East Coast musicians. 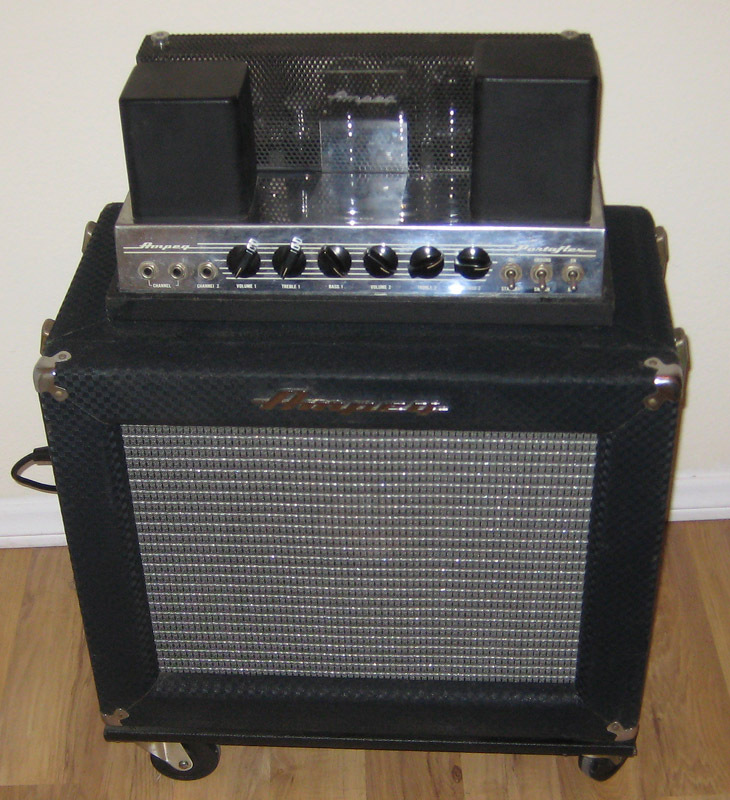 The B15-N Portaflex bass amp is a classic with its "flip-top" design. 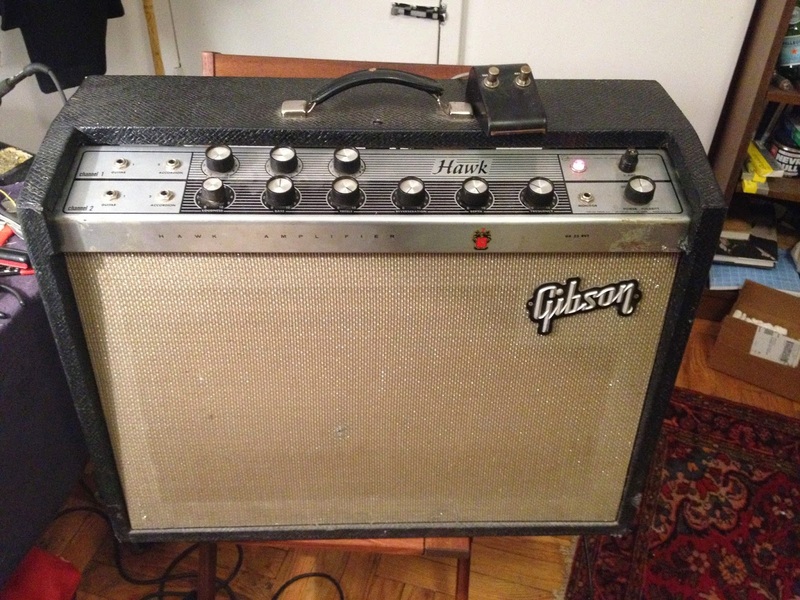 This amp was used on hundreds of recordings. Their Reverb Rocket was an excellent guitar amp. 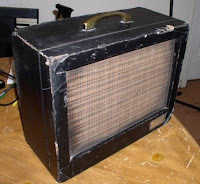 In fact it was the first amp made with built in reverb. 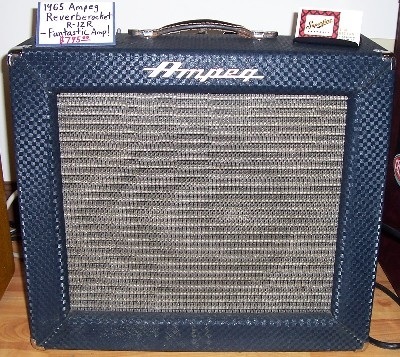 Several prominent amp and guitar designers worked at Ampeg, notably Jess Oliver, Bill Hughes, Roger Cox, Dan Armstrong and Dennis Kager. In 1965 Hagstrom guitars were made in Alvdalen Dalecarlia Sweden and distributed in the USA by the Hershman Musical Company, which at the time also distributed Swedish made Levin acoustic guitars. 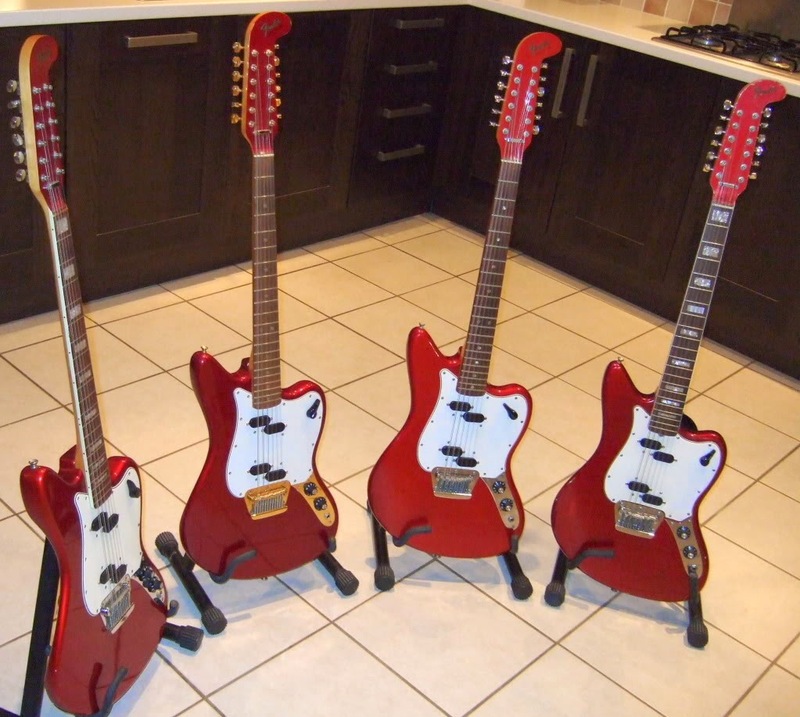 Some Hagstrom guitars resembled Fender instruments. In the U.K. they were sold under the Kent brand. 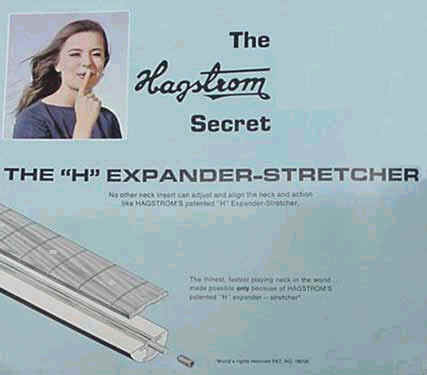 Hagstrom's neck design was spot-on Fender style, except they were skinnier that Fender necks. 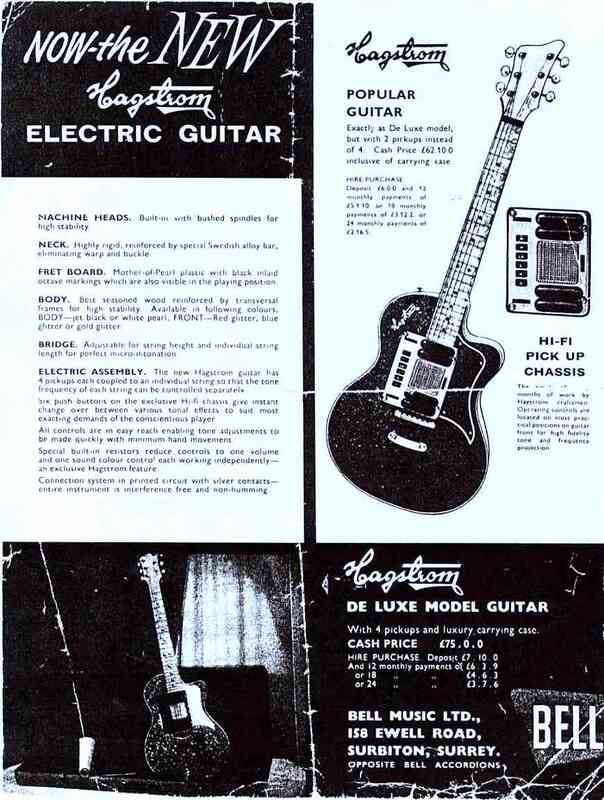 In fact one of Hagstrom's advertising points was "the Fastest Neck in the World." They called it "The King Neck". It had a unique I-Beam truss rod system. 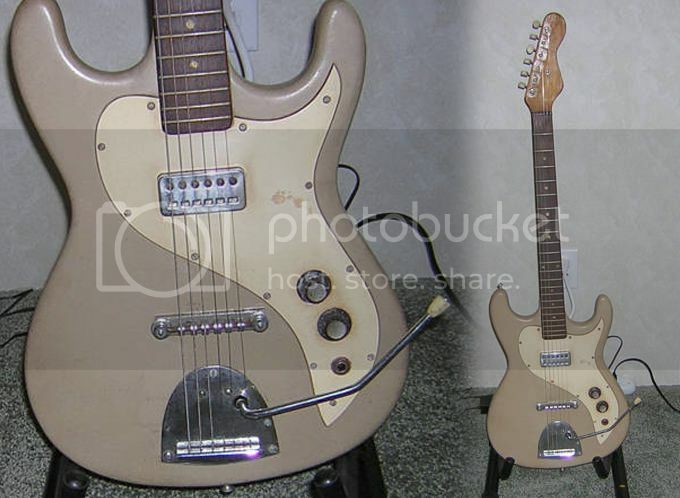 The scale of most early models was somewhat shorter than Fender's 25.5" scale. The 24" scale was more suited to students. The Hagstrom bass neck on their F-400 model was not any wider than a guitar neck at the nut. It was great for guitarists that doubled on bass. The headstock was very similar to a Fender 6-on-a-side design, perhaps it was a little more bulbous. Hagstrom pickups were great. The quality of these guitars has held up for years. The bodies were thinner than most USA made guitars. 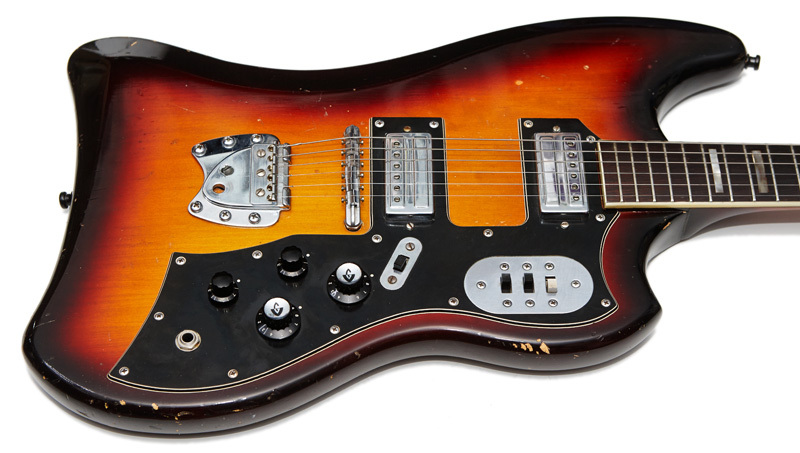 One popular version known as the Model 1 came with a lucite pickguard that was molded with a center section between the pickups. This housed a glued-in plastic rectangle that was covered with gold colored diamond shaped patterns. Supposedly this feature allowed the guitar to have an acoustic tone when played without an amp. It did not. As you can see from the models in the picture, the glue would someimes dissipate and the plastic section would fall off of the instrument. The back was covered in some sort of fabric. The necks on this model guitar and bass were generally painted black, while more expensive Hagstrom guitars came with natural wood necks. Carvin Guitars, was founded by Lowell Keisel and only sold guitars by mail through their catalog. They continue this practice today.. 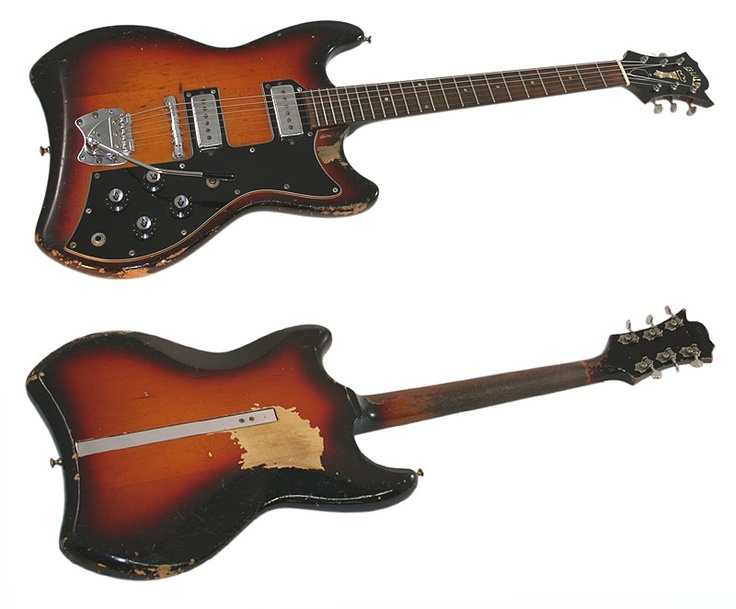 Though this comany has made great advancements on in house manufacturing, in 1965 these California assembled guitars were fairly basic. The body was shaped, routed, sanded and painted at the factory while the necks and pickups were actually made by the Hofner company. During this year, many of their offerings resembled Fender guitar, although some had a rather odd design. In 1965 Carvin was a great alternative to imported guitars. 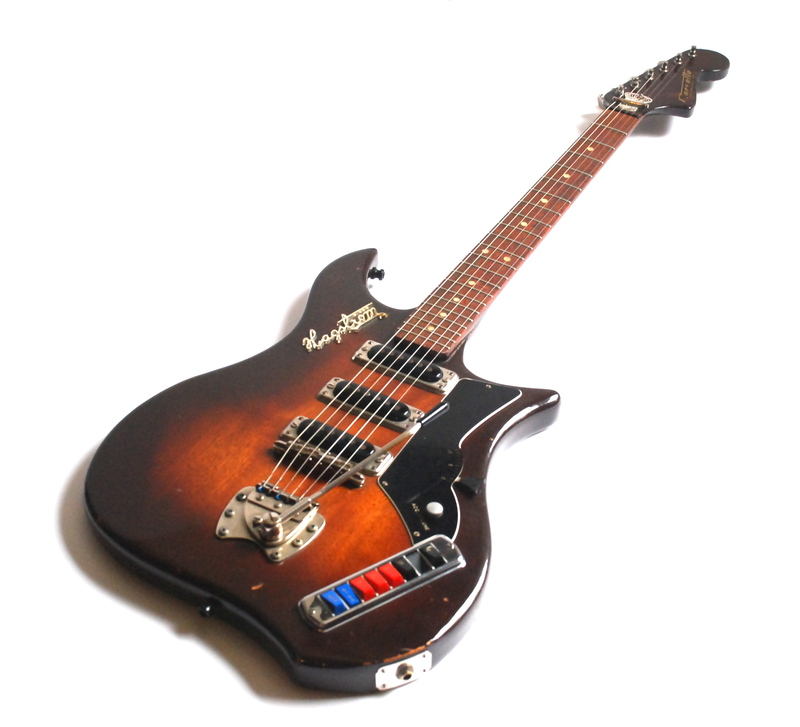 Teisco Del Ray guitars were built by Kawai Musical Instruments of Japan. The name was an acronym for Tokyo Electric Instrument and Sound Company. 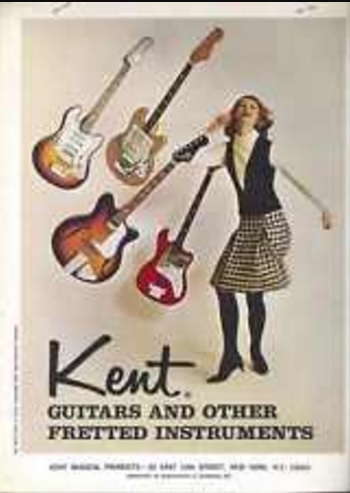 In 1965 the market was literally flooded with thousands of imports from Teisco, Guyatone, which built Kent guitars, Ibanez and dozens of nameless brands that jobbers would sell to retail stores. 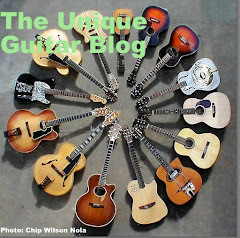 Most of these guitars were cheaply made, using low cost wood, inexpensive single coil pickups and low cost materials. Many of these instruments were sold through pawn shops or music stores that could not obtain a franchise to sell Gibson, Fender or other quality brands, and wanted to cash in on the guitar craze. 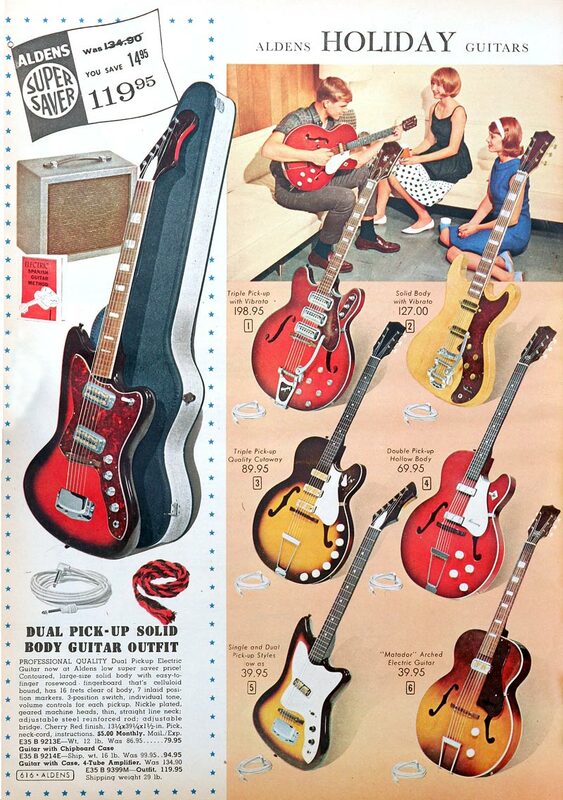 Some of these guitars were sold through other retailers such as Sears, Montgomery Ward, J.C. Penny and Western Auto as low priced beginner instruments. These same Asian companies also made and marketed low watt amplifiers. Like I said in the beginning, there were no computer-aided-design or cutting machines in 1965. Japanese transistor radios were just hitting the market and still expensive. Transistor electronics would be the first step in replacing vacuum tubes, but this was fairly new technology in 1965. In a few years Fender/CBS would try it's hand at a solid state amp, but it would be a dismal failure. 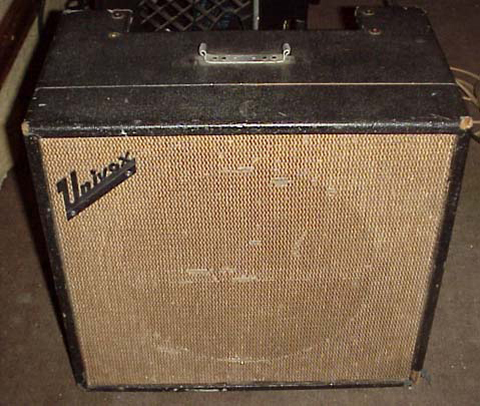 However there was one exception available in 1965, this was the tuck-and-roll Kustom Amplifier. These were transistorized amplifiers that were designed and manufactured by Bud Ross of Chanute, Kansas. They were virtually indestructible and many of them had a separate 100 to 500 watt amplifier head with a huge speaker cabinet that contained two or more 12 to 15 inch Jensen heavy duty speakers and all of them were eye-catching, especially with their blue and silver sparkle tuck and roll Naugahyde coverings. One other option for young guitarists in 1965 was Kapa guitars. These instruments were made by the Venneman Music Emporium in Hyattsville Maryland. The bodies were somewhat Fender-like as were the necks. The necks and pickups were made by the Hofner Company of Germany. Compare them to the early Carvin necks. These guitars sold at half the price one would pay for a Fender guitar and Kapa guitars were great instruments. Kapa came out with an excellent 12 string model. These guitars are treasures. If you have one, hang on to it. 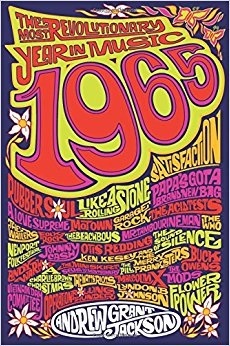 1965 was a banner year to start playing guitar and a great year for guitars and amplifiers considering the electric guitar and guitar amplifier were only invented around 35 years earlier. In review 2015 offers a greatly improved selection of electric and acoustic guitars and basses due to advancements in manufacturing and better quality or parts, In my opinion this will lead to better instruments for young and seasoned players alike. And though you may no longer to be able to buy a Fender Deluxe Reverb for $200, consider the median income for a family in 1965 was less than $5000.00 USD a year. Enjoy what you have and by all means play your guitar! In 1965 I wanted a Fender Mustang! Not sure why. Never did get one. Then I wanted a Vox Teardrop till the Byrds appeared and my electric guitar interest changed to a Rick. 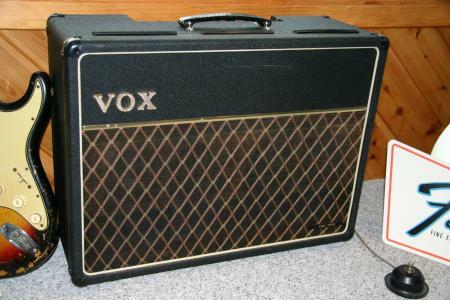 For an amp, naturally I wanted Vox because of the Beatles but I would have settled for a Fender! A good friend played a Hagstorm through a Fender Delux Reverb. With a few years, many of my friends were playing through either Kustom or a brand called Sound (not sure where this amp originated.) Mostly they played them because they were cheap, loud, and in the case of Kustom the company replaced them free when they were damaged by Who-type antics! I profiled the Fender Mustang a few years back. It still is a great guitar with some unique features. There is a 3 way switch above each pickup that can reverse the pickups polarity, which comes in handy with single coil pickups that tend to pick up 60 cycle hum. The Mustang has one of Fender's best vibrato systems. In my opinion it is superior to the Stratocaster version. Sound City amps were made by Kustom. Bud Ross created some great solid-state amps, but was terrible with money. He lost the Kustom Company in a card game. To get back in the amp business he came up with some new versions. One was called Sound City. 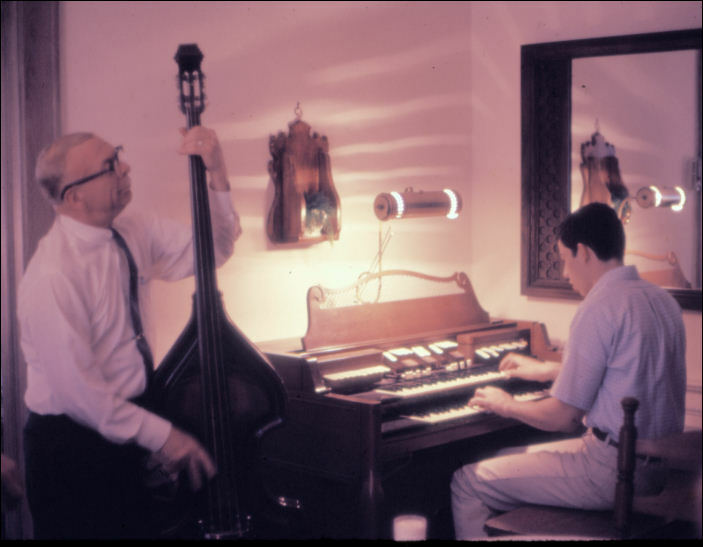 The Jesus House had a Casino PA system, which I believe was made by Kustom. Kustom eventually wound up being own by Davitt and Hanser, which is a music wholesale business that was in Delhi Township in Cincinnati. They became Hanser Distributing and moved to Hebron Kentucky. I think another company recently acquired them, but they are still in Hebron. I really enjoyed your piece. You and i are about the same age. 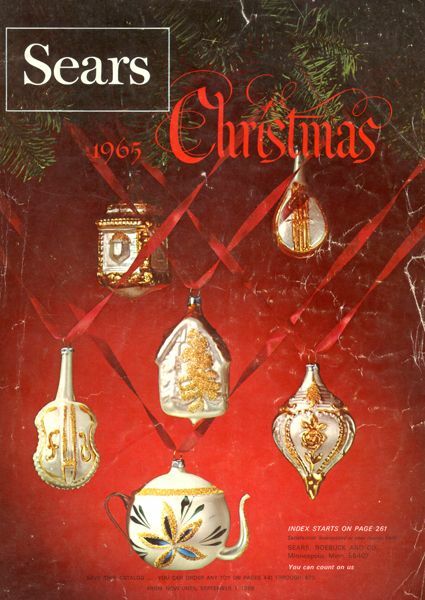 I was looking this a.m. For a wards/ sears wishbook, from 1965. I wanted a green electric, kind of that creaey green color of the chevys in the 50's. Also remember sunburst. Those guitars, probably Airline, burned into my memory. I have yet to find the green electric in a catalog, and, i never got it. The gibson es 335 you show, is an S for stereo. I actually had one for a few years. 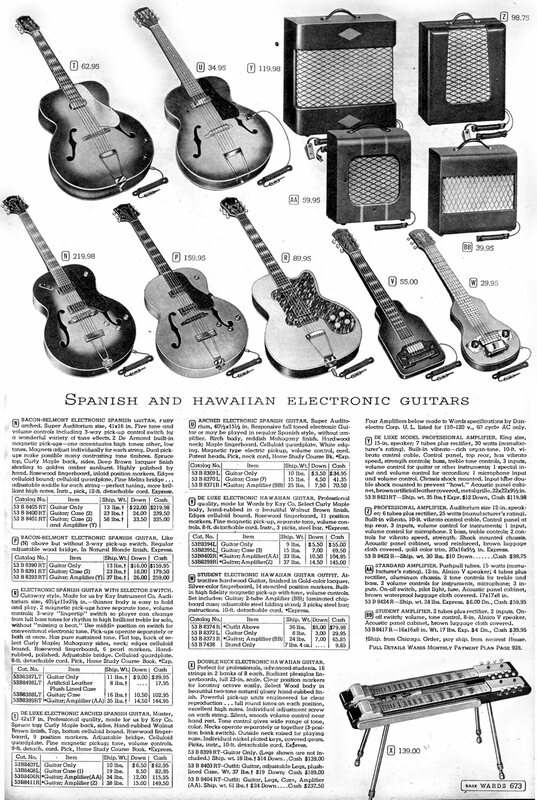 Do you have an uncropped picture of the catalog page with the Res-o-Glass guitar? I ask because the "vibrato" guitar in the ad that is mostly cut off appears to be the same basic shape as my Penncrest hollowbody from around that time.